Here is Nana, my Auntie Anne and cousin Shannon in 1979. Shannon now has a little girl the same age as she was in this picture….perhaps you’ve even seen her right here on this blog. If Nana was the queen of the icebox rolls, then Auntie Anne, along with my dad, are the heirs apparent of the icebox rolls. I’ve never even made this dough–but only because I don’t have to. They always make it. I suppose I’ll have to get around to learning how to do it myself one of these days. You can make this versatile dough into anything. It really makes good rolls. My family is quite serious about these rolls. They are a MUST every Thanksgiving and Christmas. And Easter too, if we get around to it. 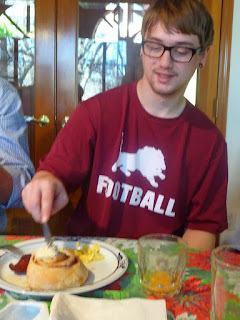 We make dinner rolls and cinnamon rolls. The very best cinnamon rolls. I’m not kidding about that either–they are the BEST. Nana used to make orange rolls for Christmas morning too, but they’ve gone out of fashion for the more favored cinnamon roll. 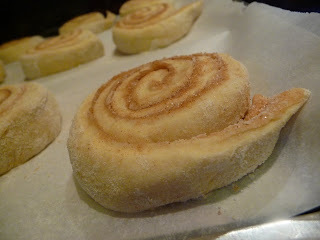 I think the orange rolls were similar but used orange zest and maybe an orange juice reduction inside of the roll? These are the dinner rolls we made this year for Christmas Eve. Not the traditional shape we use, but made into Parker House rolls instead. This is the only picture I could find of our usual roll. On the left. They kind of look like lips. 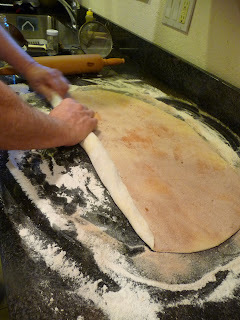 You cut out rounds of dough, then using a butter knife, make a shallow cut and fold them in half. Let them rise then bake. The fold makes a perfect place for the pat of butter. 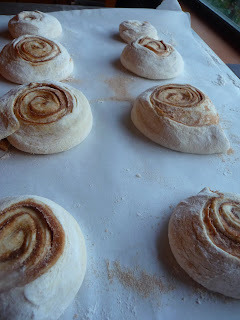 To make the magical cinnamon rolls, roll the dough to 1/2″ thickness. 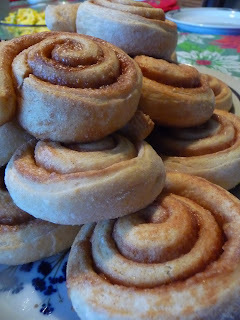 Spread with melted butter and a mixture of cinnamon and sugar–and go a little heavy on the cinnamon. And plenty of it! Don’t be stingy with the cinnamon-sugar. Make sure you cover the dough completely. 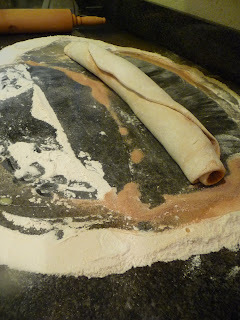 Roll the dough up, jelly-roll style. Then cut into rounds, 1-2″ thick. Some people in our family like the thinner ones, but I personally like the big fattys. 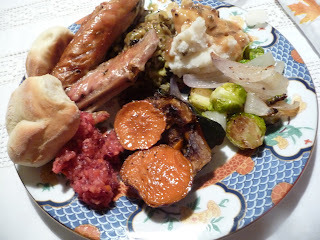 Place them on parchment paper on baking sheets and set aside someplace warm so they can rise. Big fattys rising….they should just about double in size. Bake them in a 375* oven for 15-18 minutes. Keep your eye on them, though, they’re not so great when they’re too done. 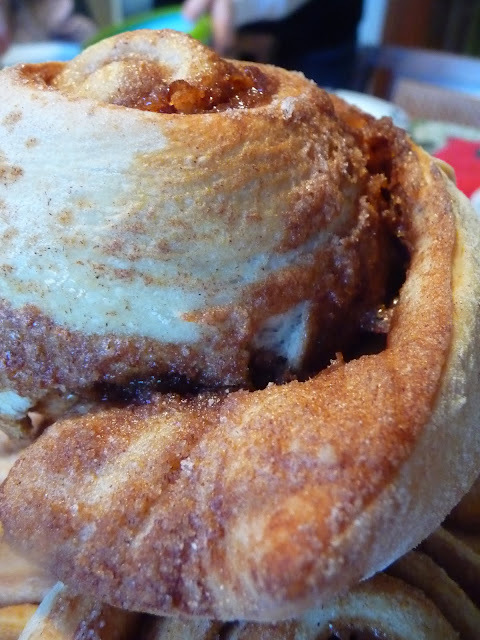 And the big daddy cinnamon roll! Just look at the state of euphoria this child is in. This kid can hardly wait. And in case you were wondering, no, there is no frosting. We prefer a big ol’ pat of butter. Add 3 beaten eggs and the yeast mixture. Mix and add approximately 4 pounds all-purpose flour. Brush with melted shortening. Cover and set in a warm place. When doubled, punch down. At this point, dough can be set someplace cool and used later. We typically store it in a big covered pot in the garage during the winter months. 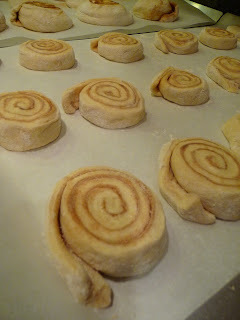 When ready to use, cut out the rolls, let rise until doubled, then bake. 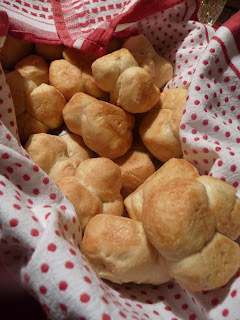 Dinner rolls: 375* for 10 minutes. 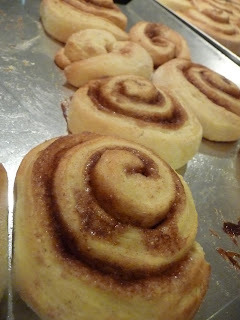 Cinnamon rolls: 375* for 15-18 minutes. Previous post: Ooey Gooey Cheesy Creamy-Potato and Leek Gratin.